When your cat comes in, he has to lower his head to enter the flap. This allows the magnet to rest on the tunnel , which activates the see saw inside the cat flap, which in turn allows the door to pass over the latch. being attracted to the central part. Push on the door and it should open. When you remove the magnet and push on the door, it should not open. Note that the latch does not drop down when the magnet goes onto the tunnel; the see saw drops and allows the flap to slide over the latch. When considering a pet patio panel, you first need to determine the kind of sliding glass door you have. You can easily install a patio pet panel door into both exposed and recessed doors. An exposed sliding glass door frame is visible and exposed in the interior and exterior wall. You can see the track the door slides into. A recessed frame is flush with or barely visible in the interior or exterior wall. You can't see the track the door slides into. If you have a recessed door, you will need a Patio Panel Kit (not included) to install your pet door. Contact the Customer Care Centre to purchase a Patio Panel Kit for Recessed Doors. Worn on your pet’s collar, the Passport™ Key uses Radio Frequency Identification (RFID) technology by using a unique code to signal the Passport™ Intelligent Cat Flap or Passport™ Intelligent Dog Door to operate as programmed for your pet. The Passport™ Key does not require a battery to operate. One Passport™ Key is included, which you can program to operate with your door. The Passport™ Pet Doors can be programmed for up to 20 pets with additional Passport™ Key accessories (sold separately). If you don't hear 3 beeps after trying to program your Passport™ Key or microchip or the pet door gives you a message that says programming was unsuccessful, try the following troubleshooting steps. Program only 1 pet at a time. Any other keys or microchips near the pet door will prevent proper programming. When you press Enter to accept the date and start programming your pet, don't hold the Passport™ Key in your hand against the LCD screen. During programming, hold the key or microchip 12-15 cm from the centre of the flap, about two hands’ length away from the pet door. Remove household appliances and electronic devices that might interfere with the programming. Move the pet door and try programming the pet again in another location away from possible interference. Contact Customer Care for additional help. We don't recommend installing your pet door if your pet isn't successfully programmed. Green 1 blink every 6 seconds No sound The door is receiving power from the adaptor or battery. Red 2 blinks every 6 seconds If the optional Low Battery Mode alert is on and the volume is on, you will hear a single beep. If you’re using the rechargeable battery, this means the battery is low. You should plug the door into the adaptor and charge the battery. Red 1 blink every 6 seconds If the volume is on, you will hear a single beep. There’s a problem with the door. Check the error message on the door’s LCD screen. If the door has an ongoing problem or if you have issues after turning off your door, you might need to reset your door. The reset button reboots your door while keeping your programmed settings. The Reset Button is the small, pin-sized button located on the control panel above the USB connection. Use a small push pin or paper clip to push the Reset Button, then release it. After your door reboots, the startup screen will appear and then return to Main Menu. When powered by the optional Passport™ Rechargeable Battery, Low Battery Mode lets you choose to set the door to open or locked when the battery charge runs low and shuts down. You can also set an optional audible alert to notify you when the battery is low. The default factory setting is off for the beep alert and locked for the flap if the battery shuts down. When the Passport™ Pet Door enters Low Battery Mode, “ATTENTION” will appear on the LCD screen, and the LED light will blink red twice every 6 seconds. The wireless card for the Passport™ Pet Door will let you connect your pet door to your computer or smart device for remote programming. We apologize for the delay in releasing this product and hope to have it available soon. The pet door has been designed to stand up to the toughest pets, with up to 45 kg of push-through strength. Because of the way our electronic pet doors are designed, flaps aren't available separately and can't be replaced. In the unlikely event that your flap breaks, you will need to purchase and install a new pet door. We apologize for any inconvenience. 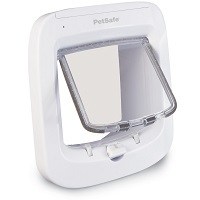 The PetSafe® Microchip Cat Flap is designed to read the most common type of microchip FDX-B (15 digit). Use our Chip Checker to check for compatibility.